Everyone needs a power-assist at times, and if you think an electric skateboard is for you – look what our pro-skateboarder engineers came up with. With carve and turn action, The RazorX Cruiser is a high-performance, high-quality skateboard, powered by an electric rear-wheel motor and controlled by a hand-held remote. The wireless, digital, hand-held remote brings the power of the RazorX Cruiser’s kick-to-start, 125-watt motor from under your feet to the palm of your hand. Variable-speed control helps ease you in and out of the skate action, allowing riders to increase and decrease their ride speed at any time by pushing forward or pulling back on the control stick. With our soft-start kick activated technology, the motor ramps up slowly, reaching top speeds of 10 mph, and slows to a stop with the pull of your thumb. Even when you’ve run out of battery juice, this board shifts into manual and performs like a normal skateboard without interrupting your fun flow. Virtually maintenance free, our kick-to-start, 125-watt, geared, rear-wheel-drive motor delivers a smooth, responsive ride without alignment issues, chain or belt. It’s power you can count on for electric skateboarding action at speeds up to 10 mph (16 km/h) for up to 40 minutes of continuous use. Put fun on cruise with the lithium-ion-powered electric skateboard made to zoom! 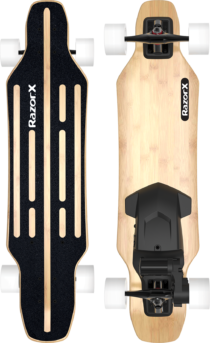 The RazorX Cruiser is a skateboard with an electrifying kick, putting control of a 125-watt, geared motor in the palm of your hand and under your feet. The versatile RazorX Cruiser features a kick-to-start, 125-watt motor, providing lithium-ion-powered electric skateboarding action at speeds up to 10 mph (16 km/h) for up to 40 minutes of continuous use. Includes a wireless (2.4 GHz) remote with wrist strap (replaceable) for variable-speed control of the electrifying carve-and-turn action. Additional features include ground-gripping urethane wheels and custom, reverse kingpin trucks for enhanced stability, perforated grip tape and rear-drive, hub motor with no alignment issues, chain or belt. Great product my 9 year old son lovesThis product has worked amazingly well and my son has loved riding it around the neighborhood. We may have done something wrong but for some reason the battery will not hold a charge. I called razor and as usual amazing customer service. They are sending us a new battery free of charge possibly because it’s on backorder or possibly because they’ve had issues with it. She didn’t say why but it seems like every time I call razor with a product issue they are so great about taking care of it or helping me with it. I do highly recommend razor products of any kind with the amazing customer service That they have. Thank you razor for keeping us rolling! !